Before I became ill, my husband and I splashed out on some tickets to see the athletics at the London 2012 Olympics. We thought this was a once in a life time experience that we and our kids would always remember. I was determined not to miss out on this special event, despite being unable to walk more than a few metres, unable to stand for long and unable to interact with others without getting fatigued. We planned the day carefully. Fortunately we had included my mum in the original ticket buying which meant an extra adult on hand to assist my husband with caring for me and the children. 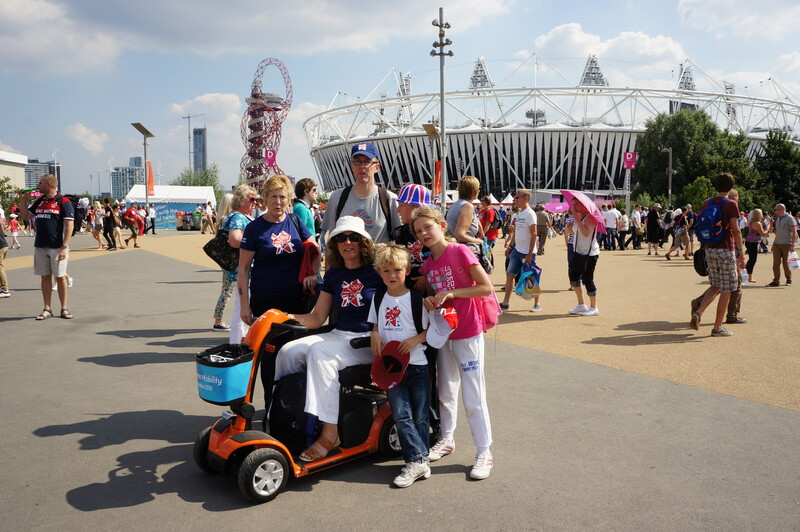 We traveled by train to the Olympic park, I was in a wheelchair, and we booked a mobility scooter at the park so that I could travel around independently. All the volunteers at the park, and at the train stations, were incredibly helpful and supportive and helped us manage the day. I did have to negotiate some steps to our seats, but it was only one flight. We had a great time watching the athletics, and I think the atmosphere and positive experience kept me going. When we left the stadium I realised I was completely drained. I could not form sentences or answer my mum’s questions. I remember sitting on a chair, waiting for my husband to bring my mobility scooter from where it was parked and putting my hands over my ears and moaning, because I couldn’t answer my mum, or even tell her that I needed her to be quiet. My mum and husband took me to the first aid area and I was allowed to lie down on one of their beds. After an hour the family came back for me and I was sufficiently recharged to explore the park with my mobility scooter before we returned home. That day out was one of the highlights of my year. A wonderful, positive experience, which our family will always remember, but I also remember how scary it was to be so exhausted that I couldn’t even ask for help, let alone help myself. As I’ve been blogging for some time my recovery is going great guns, and I can now plan outings with my family. 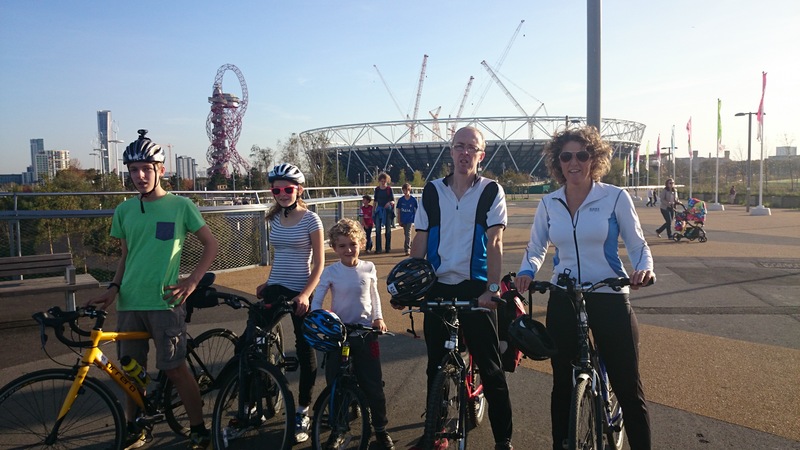 In the half term holidays we planned an outing with my Sister-in-Law cycling down the River Lea to the Olympic Park. We met at a car park near a lock on the river and cycled about 5 miles to the Olympic Park, then round the park – noticing all the differences since our last visit. We stopped at a fabulous new play park near the velodrome, and also visited a cafe that served gluten and dairy free cake (it’s a rare treat for our family to find somewhere serving sweet stuff that everyone can eat). Then we cycled back to our car and drove home. Not only did I manage the whole day out, but our outing was on 31st October. My children had made plans with their friends to go trick or treating, so I had to quickly cook some food, and help them with their costumes. I also walked round a couple of streets supervising my youngest son and his friend. The difference in my two experiences is incredible. I am grateful for both outings, but so appreciative of my current physical abilities. What a great achievement Sarah. That’s a lovely family picture. Thanks Louise. I hope you’re still doing well. Thanks for asking Sarah. I was doing great, culminating in a 40th birthday party with dancing and a 40th girls weekend in London! Unfortunately I’ve got a horrible virus at the moment, I’m digging deep with the meditation etc and trying to reassure myself it will pass. Wonder whether that anxiety with illness ever goes away?